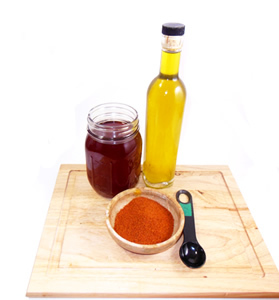 Cayenne oil is not nearly as irritating to the skin as capsaicin creams, and I use it regularly for lower back pain, neuralgia, sciatica, muscle aches, fibromyalgia and arthritis pain. For quick headache relief, massage the oil, or a cayenne balm across the temples. Cayenne oil can also help to clear psoriasis and deter itching. Cautions: Cayenne oil contains capsaicin, which causes a burning sensation. This is normal and should decrease with repeated use capsaicin only causes the sensation of damage, not real damage to tissues. Test the strength of your oil on a small patch of skin to gauge its effects before applying to wide areas. Use a steady source of low heat for 10 days to 2 weeks, apx. 100 degrees F.
Stir every day until the last. Pour off into a clean jar and let settle overnight. Decant the clear oil off the top.